The buckler is a small shield. It makes a poor weapon (although the studs driven into it improve bashing damage), but it is very light and is effective for blocking. It also protects the hands and arms as if it were armour. Skill type: Shields (also benefits from the Small Shield Mastery talent). Good styles: Scorpion, Crane, Swallow, Crab and Dragon. Special: This shield protects your arms when sheathed. 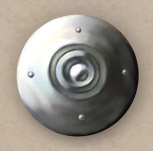 The target shield is the traditional round shield. It makes a poor weapon, but it is very effective for blocking attacks, and automatically absorbs damage as if it were armour. Special: This shield protects your back when sheathed.